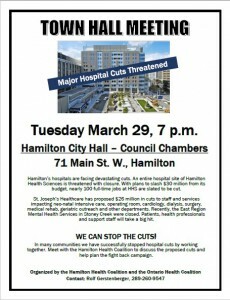 EVENT: Upcoming Town Hall Meetings: Attend one near you! Hospitals across the province are facing serious cuts to services. London’s hospitals are planning $26 million in cuts this year and more cuts are expected to be announced. 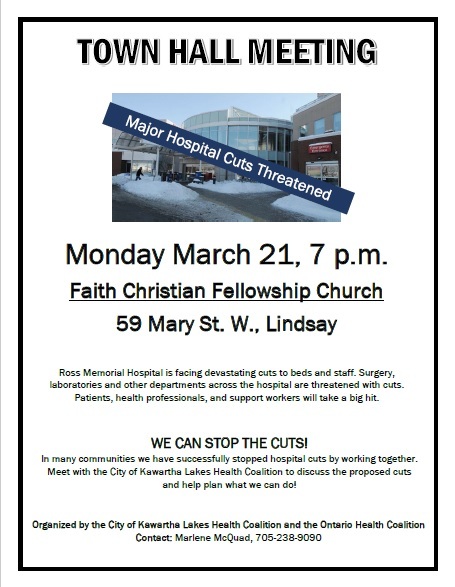 Lindsay’s Ross Memorial Hospital is facing devastating cuts to beds and staff. 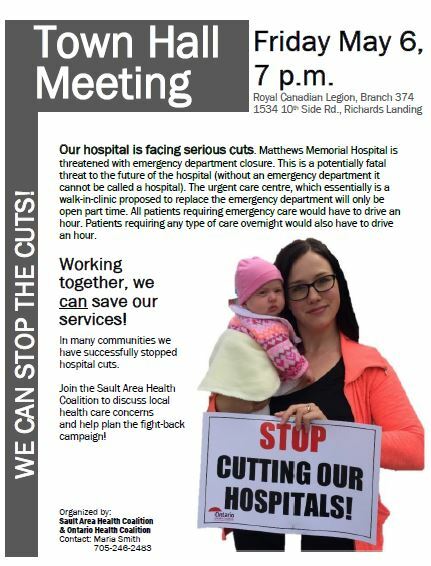 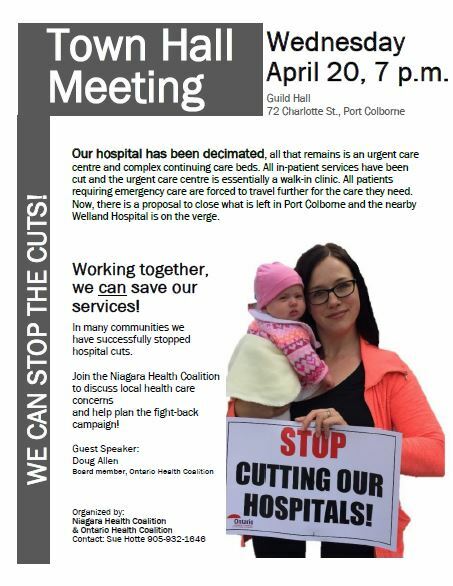 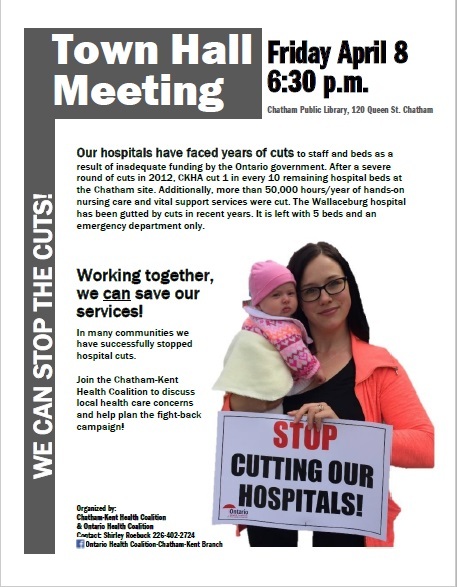 The Northumberland Hills Hospital is facing devastating cuts to departments such as emergency, medical/surgical, and laboratory services. 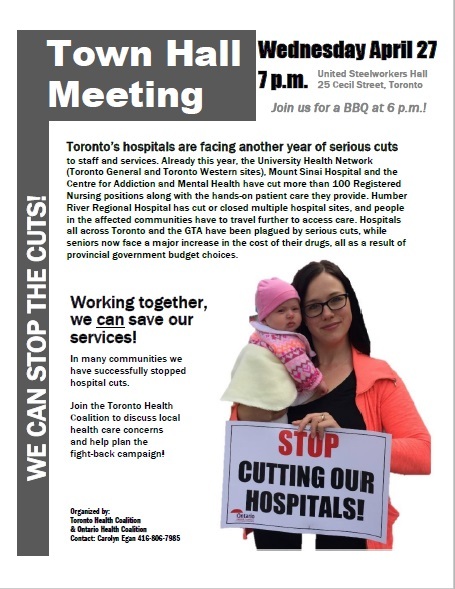 Ontario’s hospitals are in gridlock, patients are languishing on stretchers in hallways, and surgeries are being cancelled for budgetary reasons. 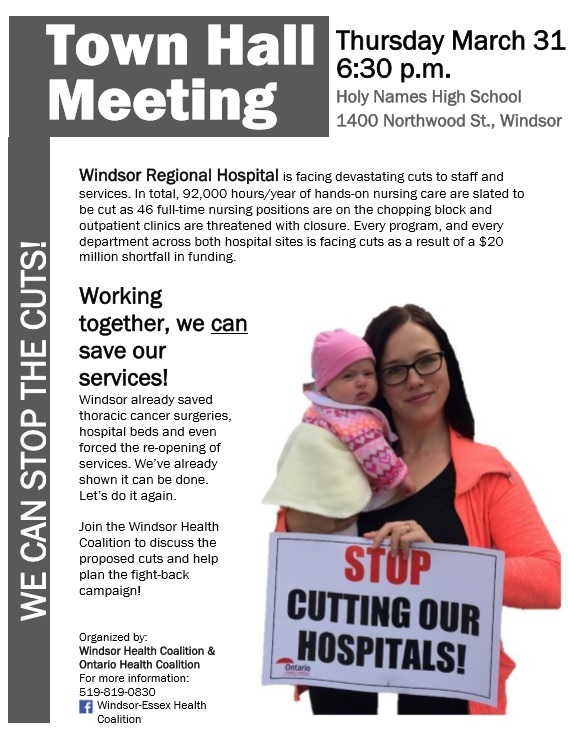 WE CAN STOP THE CUTS! In many communities, we have successfully stopped the hospital cuts by working together. Attend your local Town Hall Meeting to discuss the proposed cuts and help plan the fight-back campaign. 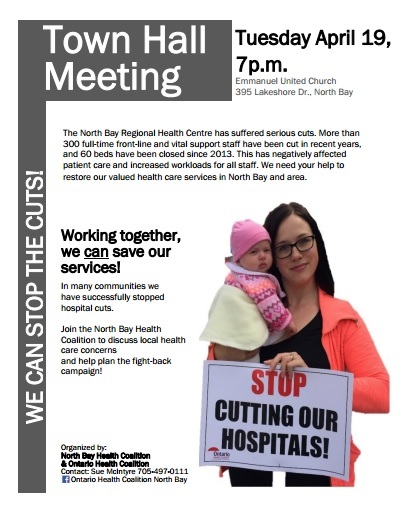 Monday March 21, 7 p.m.
POSTER (JPG) – please use this image to share on social media! 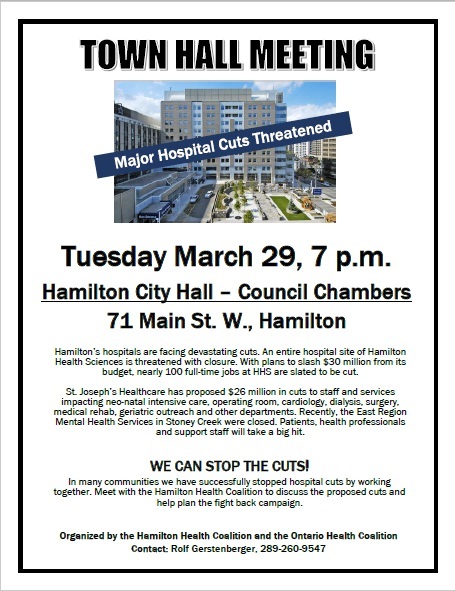 Tuesday March 29, 7 p.m.
Thursday March 31, 6:30 p.m.
Thursday April 7, 6 p.m.
Friday April 8, 6:30 p.m.
Tuesday April 12, 7 p.m.
Thursday, April 14 6 p.m.
Tuesday, April 19, 7 p.m.
Wednesday April 20, 7 p.m.
Wednesday April 27, 7 p.m. 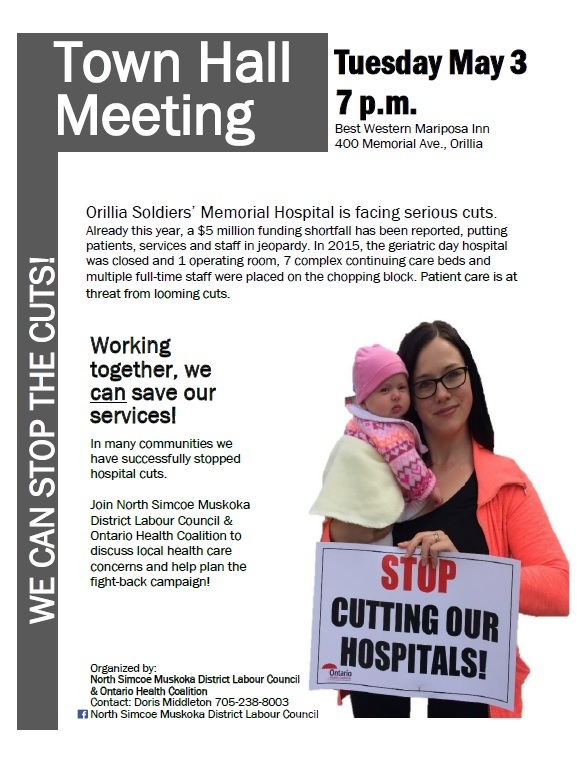 There will be a pre-meeting BBQ starting at 6 p.m.
Thursday May 5, 7 p.m.
Friday May 6, 6 p.m. THANK YOU To everyone who came out last Saturday to the Northumberland and London Town Hall Meetings. 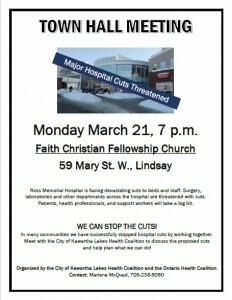 The energy was palpable, as many stood in support of their local community hospitals and demanded an end to the cuts! 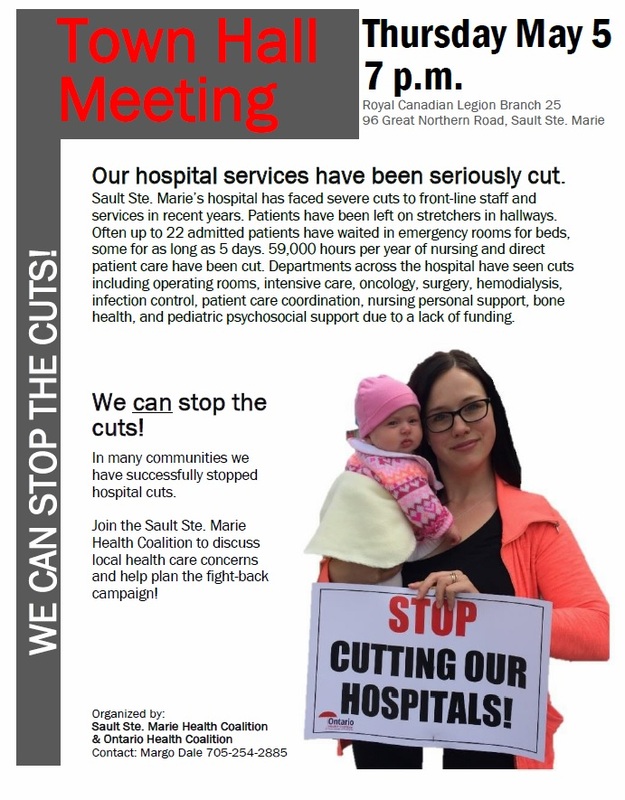 We look forward to continuing our efforts in each community and building the fight-back campaign.